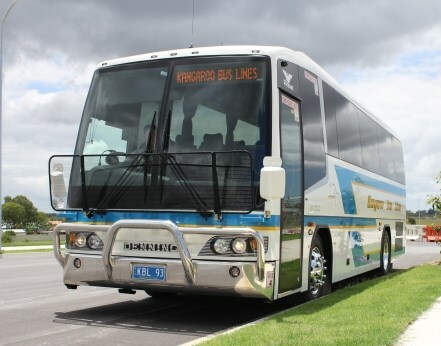 Denning Australia’s variant of its Phoenix range, the Midi, is pitched at smaller bus flexibility without sacrificing full-size comfort. 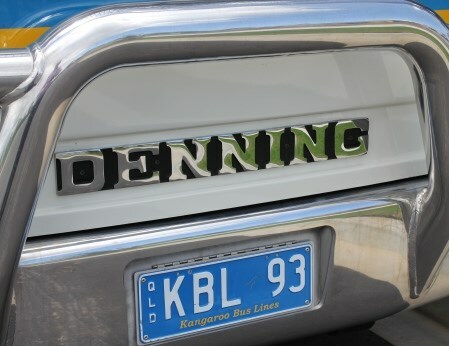 Denning Australia's Phoenix Midi combination keeps up the proud tradition of local bus and coach manufacturing. 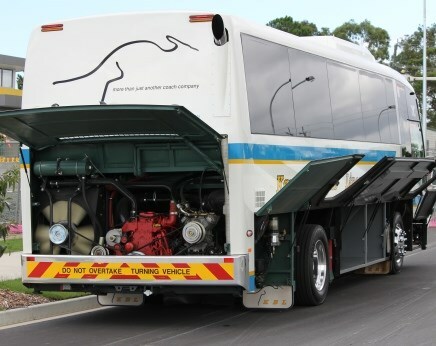 While there is no shortage of doomsayers ready to sound the death knell for Australian bus manufacturing, there remains a strong core of local production looking to maintain Australia's proud heritage of bus and coach building. 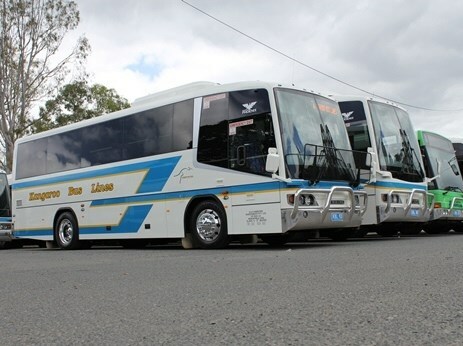 Denning Australia, long a favourite of bus and coach operators around the country, is one of the leading local manufacturers with its Phoenix model range of buses and coaches. The Phoenix design is proving extremely flexible, offering operators everything from a low floor route bus to a double-decker coach that is still capable of operating as a route service bus. The new Midi is the latest interpretation, effectively a short-wheelbase coach perfect for boutique operations where a full-size coach is too big, or to take 'overflow' bookings in conjunction with a larger version. 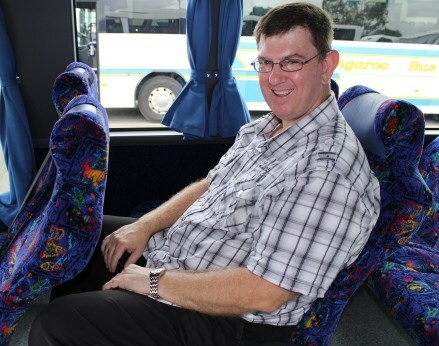 For Darren Webster, General Manager of Kangaroo Bus Lines at Morayfield, north of Brisbane, this is exactly the logic for ordering the Midi; it provides additional flexibility to the existing fleet while remaining capable of working as a stand-alone unit. One of the advantages to having a single base design that can be modified into numerous variants is a commonality that creates a family look among the different versions. In the case of the Phoenix, this means the Midi retains the same profile and front end as its bigger siblings, so that operators can reduce the spare parts inventory of panels, lights and windows, a big advantage in an economy where operators face constant pressure to reduce overheads. The Midi offers drivers the same tall windscreen, with its extensive forward field of view, supported by a full-height driver's side window to help eliminate blind spots when pulling out from the kerb. The screen has a slight rearward rake to help smooth the airflow, without creating a large heatsink in the front of the cabin. Although a forward control vehicle the front overhang is in proportion to the rest of the bus, which also helps driver familiarity, the front end retains the same ground clearance as the larger Phoenix allowing the Midi to travel the same roads. Similarly, the rear overhang and departure angles are close to the larger models, the only visual indicator of the difference is the shorter mid-section and overall length. 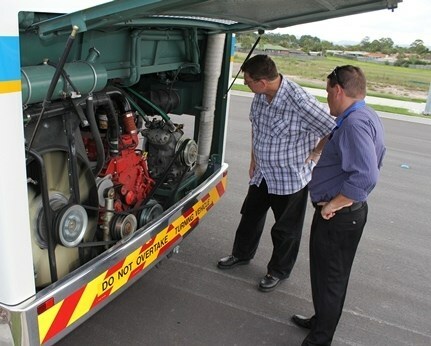 Access to the storage bins, engine bay, fuel and AdBlue tanks are via swing panels on self-supporting gas struts, with the fuel and urea tanks mounted just behind the steer axles to maintain weight distribution, while the engine, air-conditioning and transmission are all rear-mounted. The storage bins are accessible on either side, allowing for faster loading and unloading, although the spare parts tray, mounted centrally and separating the fuel tanks and fuse box, juts into the load area enough to snag items being pushed from one side to the other. The kerbside storage bin also houses a rectangular urn on a slide out tray, complete with drain hole in case of overflow, with a dash-mounted on-off switch, allowing the driver to 'put the kettle on' while travelling, providing ready-made hot water on arrival at a stopping point. With the optional vehicle raising fitted in conjunction with the standard Denning airbag suspension, entry and exit is simplified on uneven ground, while the airbags allow the driver to crawl across rutted tracks by lifting the body to clear obstacles. Although the Midi can have 41 or 45 seats, Webster earned the gratitude of tall passengers by sticking to the 37-seat option; even in full recline there is plenty of clearance between the seat back and passengers' knees. The Styleride recliners are comfortable. Webster has a 'corporate' trim for his entire fleet, making repairs easy and reducing the need for multiple fabrics to be held, another example of effective cost control. The interior trim is exemplary. Webster says he has never had an issue with the fit and finish of the Denning product, with excellent dust and draught sealing around all joints ensuring passenger comfort is maintained over the life of the vehicle. The quality of the trimming extends to the flooring, a key area for bus and coach operators as the implications of a passenger tripping on loose or poorly finished floor coverings are massive. Also impressive is the heat and sound shielding above the engine bay. The only real 'fail' on the bus is the thick left-side A-pillar that combines with the swing out door to create a major blind spot for the driver. While this can be reduced by drivers adopting the 'long-necked goose' method of bobbing their head back and forth at intersections, it remains a problem for safe vision that should be addressed in the next redesign of the front end. The chunky A-pillar aside, the driving position is well thought out, with clearly labelled controls for doors, interior lighting cruise control and more on a panel to the right of the dash, while the driver has a drink holder to the left of the seat. 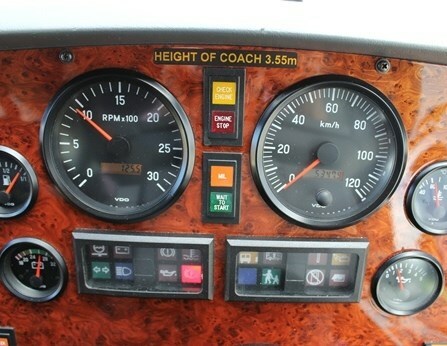 The dash itself is fuss-free, with large dials for speedo and tacho, flanked by smaller air, oil and temperature gauges, allowing the driver to sum up the vehicle's health in a single glance, while a short stalk controls the multi-position Allison hydraulic retarder. Alongside the fully adjustable driver's seat is the control panel for the Allison 6-speed T270R automatic transmission, as well as full automatic shifting, higher gears can be locked out, such as before a steep descent to help control vehicle speed. The pedals are well spaced to prevent confusion between accelerator and brake, with the accelerator requiring a firm push to get things moving. Far from annoying, it ensures the bus goes only when the driver is ready. Like most airbrake-equipped buses, the brake pedal feels wooden, with no real feedback on braking effort, instead the driver must take their cues from other sources. The good news is the brakes are linear, so that more pressure equals more brakeforce, making the Phoenix predictable - a desirable trait in passenger operations. Webster says the dash layout is common to all of his Denning models, making driver changes much easier, with no confusion over switchgear or controls. Out front is a pair of low-mounted European-style mirrors offering good rear and side vision and blind spot elimination. The low mount puts them in the driver's line of sight making it easy to switch between forward and rear vision. Although Denning offer an optional reversing camera, the shorter wheelbase of the Midi means it is not necessary as the driver has good vision of the rear end, although I would never criticize a manufacturer for including it in the design. The steering wheel is chunky with thick padding making it easy to grip. Thankfully the days of hard, skinny rims are a thing of the past. The driver can comfortably rest their hands on the wheel without needing a death grip to keep control. Another advantage of the Phoenix chassis is even the shorter version offers a full width aisle, so that passengers are not likely to get belted by swinging bags as people move through the bus. With the engine at temperature and plenty of air in the lines, it is time to close the passenger door, engage Drive, release the brakes and ease forward out of the parking bay. The steering is responsive; no 'slop' at the dead ahead makes it easy to oversteer initially but the driver should soon adjust, while the power assistance means even big armfuls of lock are not exhausting. It also makes pulling in and out of bus stops easy, while Webster says if need be the Midi can virtually swing in its own length. The airbag suspension makes light work of the flood-ravaged roads Kangaroo run on. While it is never recommended to hit big potholes at speed, the suspension reacts quickly to smooth out corrugations before the passengers begin complaining. Despite some air-suspensions allowing the body to wallow like a yacht caught broadside to a breeze, the Midi felt 'tied down' throughout the test, even walking over large speed bumps, generating plenty of confidence in its ability to deal with a variety of road conditions. Although the brakes are predictable, in general driving they are almost unnecessary thanks to the outstanding Allison retarder. Webster's drivers generally set it at 40 percent of capacity, cutting in when the throttle is released to act as a form of speed control to quickly and smoothly reduce road speed. With more than double the amount of braking power still in reserve, operators can have plenty of confidence in the Allison retarder for long steep descents or emergency situations. Due to the light weight of the Midi, acceleration is attention-grabbing. Webster on a number of occasions urged the use of more throttle to see just how quickly it gets up to speed, and with good reason. Under half throttle there were no problems keeping up with traffic. The test also included a highway run at 100km/h and the Midi was not only happy cruising but had more than enough in reserve to round up slow cars. If the Midi were summed up a single word it would be 'complete', because of its ability to deal with virtually any challenge that comes its way. Just walking on board instantly creates the feeling that this is a bus that is ready for work, just add fuel, passengers and luggage, and for operators that is very important. That is not to say it is perfect; the left-hand blind spot proves there is still room for improvement, along with the tool tray, but these can be rectified. What does not change is the feeling of willingness to tackle any task. 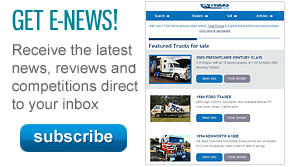 Find Denning buses for sale. 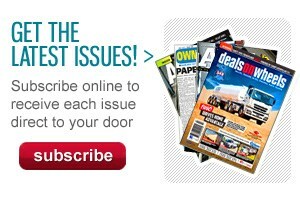 Search for new Denning specs.